A native of Wisconsin, Pastor Bob Schultz graduated from the University of Wisconsin – Steven’s Point in 1987 (Bachelor of Science). While he was in his mid-twenties, he was saved by God’s grace through the preaching ministry of Dr. John MacArthur, president of The Master’s Seminary. This led Pastor Bob to TMS where he earned a Master of Divinity. He has served as pastor of Calvary Bible Church since his graduation in May 2000. 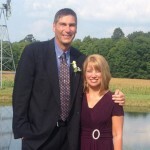 Pastor Bob and his wife, Terri, have been married since 1996. At Calvary Bible Church, elders shepherd the flock following the model of church leadership found in I Timothy 3.